Every task and job is treated as "planned", meaning that every task and job can get affected by changes to the schedule. A task's status can't be set to started or finished, or, in other words: start or end date of a task can't be frozen. The Execute Mode is just meant for setting and approving shopfloor data. The Execute Mode is deactivated by default so that you need to switch it on in the "Settings" dialog if you want to use it. When the Execute Mode is switched on, you can no longer change the planning start via settings nor via drag & drop. The only way to change the planning start is via the pulse functionality (see below). 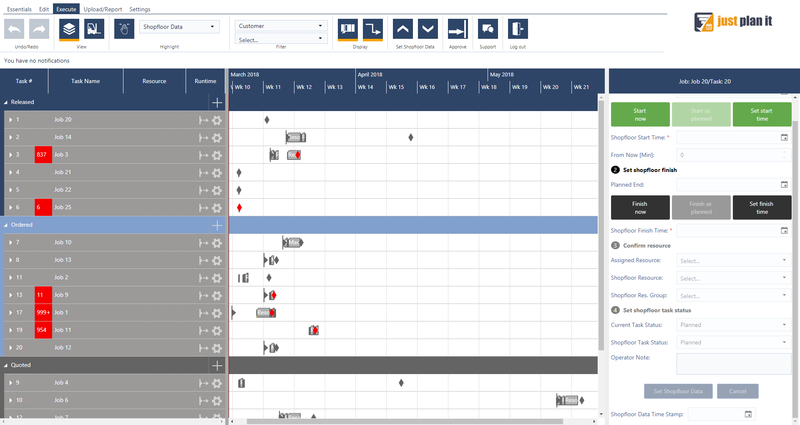 User type operator - providing the planner with any kind of scheduling-relevant information from the shopfloor. The operator can only see and set the set shopfloor data view within the Execute Mode. All other views, tabs and functions are disabled. More information on user types can be found here. 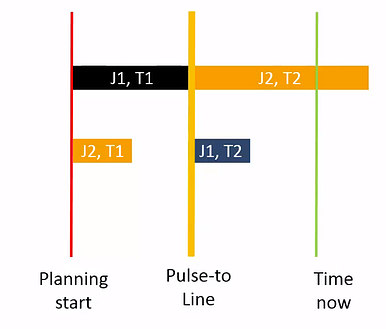 Yellow pulse-to line - representing the date to which the planning start of the entire schedule will be pushed when the planner approves the shopfloor data. Icons that have especially been added for the Execute Mode. They are described in the Menu Ribbon chapter. Set shopfloor data: Tasks are updated with information from the shopfloor. Approve shopfloor data: The submitted shopfloor data are reviewed and then approved by the planner. Read below a detailed description of these two steps. Not-yet started Provides the planner with a firm information. Can still be moved. Started Started tasks have a fixed start date and can only get prolonged. Finished Finished tasks cannot get moved any more and do no longer occupy any resources. To set shopfloor data, click the "Execute" tab in the menu bar. Handling and structure of this view is mainly the same as already known from just plan it. schedule anything. Drag & drop and all scheduling buttons are disabled. In the right part of the "set shopfloor data" stage you can provide the feedback from the shopfloor about the selected task. 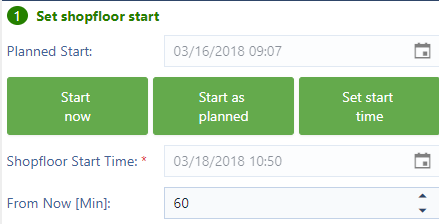 Set the shopfloor start date/time by clicking the desired button. The value entered in the "From Now" field reflects the operator's feedback that this task will run another 60 minutes, now here meaning the moment the operator reports this data and not the time/date when the scheduler approves it. Approving this information will not change the pulse-to line. After the information is approved, this flag vanishes but the note still appears (also in the "regular" Job/Resource View) in the tooltip text of the respective task. Please note that all of the information you provide in the "set shopfloor data" stage will be stored in a separate database as long as the planner hasn't approved them. By clicking "Set Shopfloor Data" the operator provides an important implicit information: The date that represents his most recent feedback. This date marks the date for the yellow pulse-to line. It is the date to which the planning start of the entire schedule will be pushed when the planner approves the shopfloor data. Approving the shopfloor data triggers an automatic update of the schedule, which we call "pulse" and by which your schedule will get pulsed to a new planning start (line). The new planning start represents said date of the most recent shopfloor information. Shopfloor data that are still "to be approved" are indicated by the "Enter Approval mode" notification icon which is placed both in the Essentials tab and the Execute tab. If you click this icon you get a summary on the data you have and on (potentially) missing data. The number of tasks marked with a green check mark will get updated according to the shopfloor data. 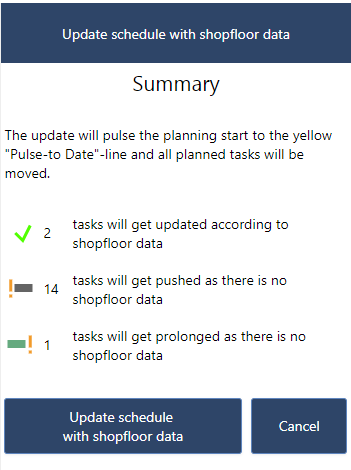 The number of tasks marked with a gray symbol will get pushed to the yellow pulse-to line as there is no shopfloor data at all. The number of tasks marked with a green symbol will get prolonged as they are started and should be finished by the date represented by the pulse-to line. The entire schedule is updated by pushing the planning start to the pulse-to line. No data will be updated bring you back to the "Set Shopfloor Data" dialog. Since the Execute Mode is a quite complex functionality we have provided for you lots of further support material. Our recorded webinars present you with a demo and an explanation of the Execute Mode. Read our blogposts about the Execute Mode: Job shop scheduling meets manufacturing execution and The Execute Mode refined.